While it’s easy to be swayed by a puppy (seriously, who can resist puppy kisses) a hyper, untrained puppy may not be a good fit for many families. They require a lot of training, patience and exercise. If you are looking to adopt and would like a dog who would fit into your home and lifestyle with little to no work, consider an older pet. Sure, they don’t have those cute baby faces and their lifespan may be shorter but there are many reasons why a senior pet just may be the perfect pet for you. 1. Older dogs come housetrained. They have an adult bladder which means no more getting up three times a night to let the puppy out and no more accidents to clean up when you get home. 2. Older dogs are past the teething stage so you don’t have to worry about sharp little teeth chewing up your furniture, shoes or baseboards. If you give an adult dog a few chew toys to keep him busy, you’ll never have to worry about your furniture again. 3. When you adopt an older dog, what you see is what you get. They will not grow anymore and you’ll never end up with what you thought was a beagle only to find out that there must’ve been a lab somewhere in his background. This is especially handy if you live in a apartment/condo or move around a lot. Many places have weight restrictions in their pet policies. By adopting an older dog, you won’t be in for a surprise in six months. 4. The personality of an older dog has been developed. No matter what type of lifestyle you have, there is a dog out there for you. By adopting an older dog, you are guarnteed to have an animal that matches your lifestyle and you can be sure they won’t do a 360 in the future. Contrary to popular belief, not all shelter/rescue animals were rescued from the street or under horrible conditions. While many are, there are still many who come from good loving homes that had to be given up for one reason or another. All animals coming from rescue have been vetted and their personality has been determined. You can be sure that the animal you are adopting is exactly what the rescue says they are. 5. It’s easier to find an older, purebred dog than you think. Many shelters and rescues are full of pure-bred dogs that were taken in from good, loving homes. Again, its what you see is what you get. You want a Maltese, you get a Maltese. If you adopt an older Maltese you won’t be surprised to see that the Maltese you adopted looks more like a poodle in a year. 6. Older dogs are instant companions. They are ready right from the minute they move it to go on whatever adventure you want to take them on. They are always up for a long, leisurely walk, to play ball at the park or to just hang out and chill in the sunshine. They are already trained so you won’t have to worry about leash pulling or bad social skills while out and about. 7. Older dogs settle in much easier than younger dogs. Many of them have already been part of a pack so they know what is expected of them. 8. Finally, if the reason you are adopting is to save a life than consider this: In shelters, puppies are usually the first to be adopted. 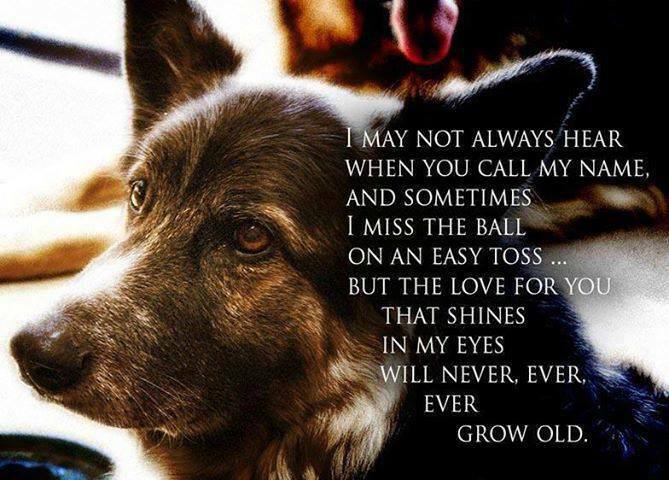 The older the dog, the longer it usually takes for them to be adopted and they are usually the first to be euthanized. By adopting a senior pet, you will truly be saving a life. If you are looking to add a dog to your family, I urge you to check with your local shelters and rescues about adopting a senior. You will truly be saving a life and you will know love and devotion like no other.